Like a good wine, some star's just get better with age. Justin Timberlake won the Fashion Oracle Award at the Fashion Group International's Night of The Stars ceremony, and he jokingly credited his win to his boy band roots. He might have started his career in overalls on The Mickey Mouse Club, but just look at where he is today! According to his website, Timberlake received the award for his clothing line William Rast, but part of me wants to believe that it's also because of his amazing personal style. Although it's impossible to forget his Ramen noodle hair and colorful sunglasses, there's no denying that the man is now an extremely sharp dresser — and a designer, to boot. He has transformed into quite the fashionable powerhouse. During his acceptance speech, recorded in the video below, he poked fun at his boy band past by sarcastically saying that he always knew back then he'd win a fashion award someday. He might have been joking, but he always had a knack for setting trends. Heck, he even started the whole denim on denim resurgence back in the early '00s. I'd say that there's at least a little truth to his statement. 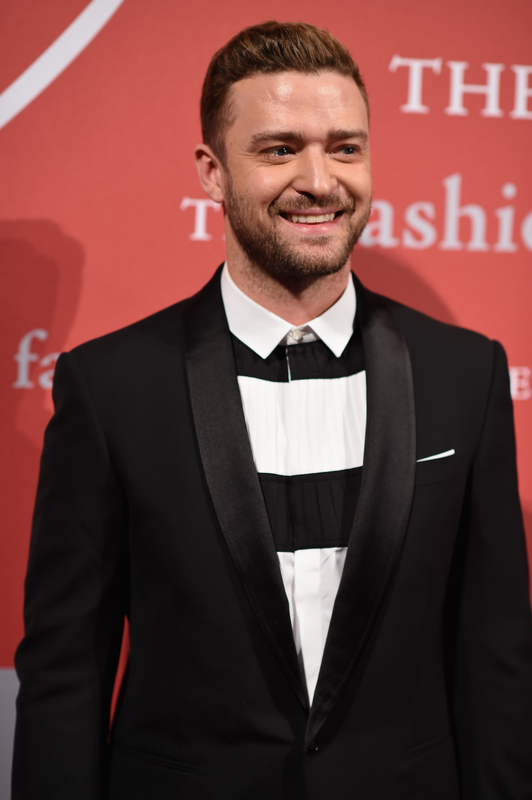 Despite his wardrobe missteps during his N'Sync days, Timberlake is by far one of the best dressed men of the moment. His look at the awards ceremony proved it, when he walked arm-in-arm with wife Jessica Biel in a classic suit with a black and white striped shirt underneath. All eyes might have been on Biel's stunning teal dress, but Timberlake also earned some style points. This wasn't the only time the man looked dapper as can be. Nowadays Timberlake sticks to more classic and timeless outfits with modern touches, so it comes no surprise that he would be honored for fashion achievements. Just take a look at some of his winning style moments. Timberlake wore a fabulously patterned suit to celebrate him being inducted into the Memphis Music Hall of Fame. The night might have been about his musical talent, but it was hard to ignore his style. He danced his stylish little heart out in a fabulous hat when cameras caught him at the U.S. Open with Jimmy Fallon. Timberlake went back to his basics in a classic suit and bow tie for the SNL reunion show. I'd say he cleans quite nicely. Sure, you're familiar with the graphic tee, but Timberlake took the trend a fashionable step forward with his graphic button-up. He juggled his awards in all-black at the 2014 People's Choice Awards. He showed up in jeans and a polka-dotted shirt to the iHeartRadio Festival, proving that even his laid-back looks are great. Timberlake looked as dapper as ever in the neutral outfit. Just when you thought he couldn't get anymore stylish, he adds sunnies. This man clearly deserves his fashion award! But also, I'll just leave this right here. Want more throwback fashion? Check out the video below, and be sure to subscribe to Bustle’s YouTube page for more hacks and tricks!